NORCO DIDN'T SET OUT TO DESIGN A BUDGET BIKE. INSTEAD, the idea was to design a really good bike. Using its own Sight model as inspiration, engineers worked to retain the key aspects of the Sight while keeping an eye on the price. 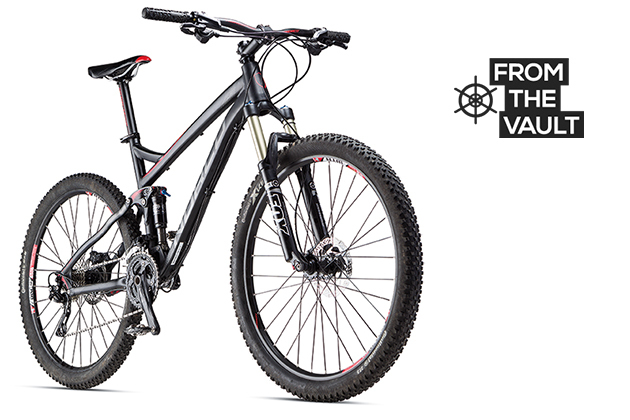 The Fluid is built around an alloy 6061 frame and utilizes the Norco Advanced Ride Technology (A.R.T.) suspension platform. The main idea is to incorporate an increased rearward axle path and fine-tune the pivot locations specific to the bike's intended use. A tapered steerer tube and tidy external cable routing with dropper-post provision round out the frame. Some sacrifices had to be made at this pricepoint, so the engineers unfortunately bypassed the rear through-axle. The swingarm still feels plenty stiff but the 2.2-inch tire is a bit cramped at the seatstay bridge. Norco pretty much nailed the parts spec. The standouts are the Fox CTD front and rear suspension, Deore brakes and WTB i23 rims. I'm always amazed at how good the Shimano Deore brakes are and was equally impressed by the WTB rims. I love the wide Norco handlebar, but swapped out the 90-millimeter stem for a shorter one. You get 30 Shimano gears, and while I understand the need to spec an XT rear derailleur for showroom appeal, I think this bike would have been better served with a clutched SLX. I like to run staggered tires so the 2.4 front and 2.2 rear Continental X-Kings made me happy. Norco nailed the geometry too. Within the first half mile I already knew I liked the bike. Short chainstays, slack head angle, low bottom bracket and 27.5 wheels are all fashionable buzz words right now for good reason; they all make riding really fun. The A.R.T. rear end makes square edge bumps disappear, pedals efficiently and feels like more than 120 millimeters of travel. I rode the majority of the time with the shock open and never really felt like it needed more compression dampening to pedal well. It's not as happy in this position while in the granny gear, but the added traction is a welcome trade off. I found the Fluid to be an excellent technical climber and a playful descender with an appetite for drifting corners. Too bad this bike wasn't around for our Bible of Bike Tests as it could've been a contender. Given the exceptional value, it may have even come away with a medal around its toptube.